Holly Holm knocked out Ronda Rousey and bagged UFC women's bantamweight title, shocking the world with her powerful head kick. Holm took the title from Rousey on November 14, Saturday night at Melbourne, Australia. Rousey was an unbeaten champion until Holm put her down during the second round of their fight. In a post fight interview, Holms shared that everything she and her team had worked on actually happened on the fight. Every move that they had expected was done by Rousey and Holm had prepared herself by being in the gym longer than she did in her life. Rousey on the other hand was not available for her after fight interview as she was immediately rushed to the hospital from the cage though the UFC president Dana White stated that the former champion did not have any serious injuries, but only suffered a split lip. 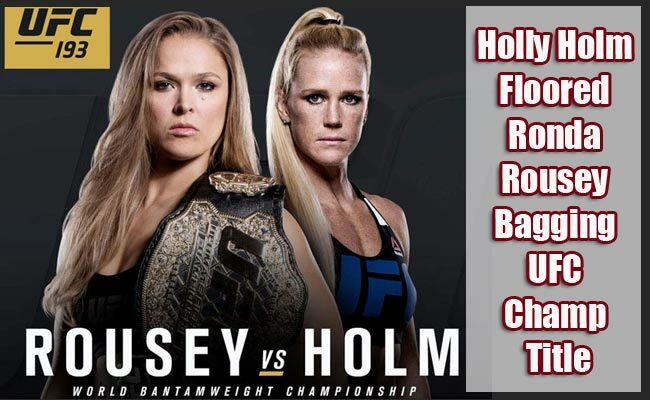 Holm was considered as an underdog that had threaten Rousey’s reign since she became a UFC fighter. The fight ended in the second round when Rousey was hit and knocked out by Holm’s head kick followed by a couple of quick blows on the head. Holm was a boxer who shifted to mixed martial arts since 2011. Her boxing experience was put to used as she aggressively countered every attacks coming from Rousey. Rousey tried to be more aggressive during the first round but ended up desperate until the second round. Holm seemed to be able to read her moves and ducked Rousey’s punch. Holm followed with a powerful punch and head kick that floored the former champion on the canvass. Holm is the first ever fighter to beat Rousey who was considered as the most feared female fighter. She was even compared to Mike Tyson. Her reign was cut short by Holms 59 seconds after the second round started.